Seriously, what is up? Will people never learn? Back in January 2009 and November 2009, InterstateQ.com unveiled massive copyright infringement and intellectual property theft by the now-defunct (see update at bottom) OutGayLife network owned by Eric Wood. In that case, Wood had stolen dozens upon dozens of other news organizations’ and bloggers’ content, including from mainstream publications and The Associated Press. See, we weren’t talking about simple quoting of a bit of an article here or another bit of an article there. No, Wood’s copying and pasting went well beyond the normal “blockquoting” you’ll see credible bloggers do on their sites. Wood was copying articles wholesale from dozens (maybe hundreds?) of websites and news organizations, often without even the tiniest bit or shred of credit (and, hey, forget about a link back to the original story). Last week’s debate over the current state and future of LGBT print media carries into this week, it seems. 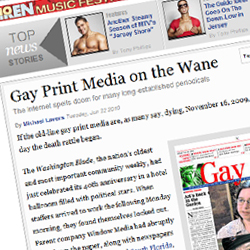 Last Tuesday, gay journalist Michael Lavers wrote a piece, “Gay Print Media on the Wane,” for the Village Voice. I responded to that piece with my own thoughts last week, as did other journalists and bloggers. On Friday, I wrapped up a good portion of the week’s discussion at Bilerico.com. Today, Washington Blade editor Kevin Naff publishes his own response, calling Lavers’ piece an “unfair attack” and claiming Lavers failed to include accurate information, fact check his work or include interviews with the subjects of his article. The recent Village Voice story, “Gay print media on the wane,” by Michael Lavers is riddled with factual errors and suffers from conflicts of interest and general amateurishness. Lavers and his editors clearly set out to write a self-serving story about the supposed demise of LGBT news outlets. And they didn’t let pesky facts get in the way of their hypothesis. Lavers interviewed me for the story and it became clear from the outset that he had already decided what to write — he just needed a few supportive quotes to fill out the piece. Hence, nothing I said to him made it into the final story. He spends significant time writing about the Blade, Window Media and the Advocate, but no one from those entities is quoted or allowed to respond to Lavers’ irresponsible and baseless claims. Instead of talking to professionals working in LGBT media, Lavers quotes an anthropology professor whose qualifications and experience in niche media are never revealed. What’s more disturbing than the lack of basic fact checking (what an old-school concept!) is that Lavers fails to disclose his work for Edge Media Network, a company he describes as “fast becoming the new gay press establishment,” a grandiose claim he offers no evidence to support. He also conveniently omits the fact that one of Edge’s senior executives, William Kapfer, was an officer of Window Media, the Blade’s former parent company that is criticized in the story. It sounds like Kapfer, an Edge marketer, wrote the story for Lavers. Read Naff’s full thoughts at WashingtonBlade.com.